Overexpression of MAPK4 in a subset of human cancers is associated with decreased overall survival and increased AKT activity. (A) Upper panel, MAPK4 mRNA expression across 8887 tumors of various histological subtypes from The Cancer Genome Atlas (TCGA). 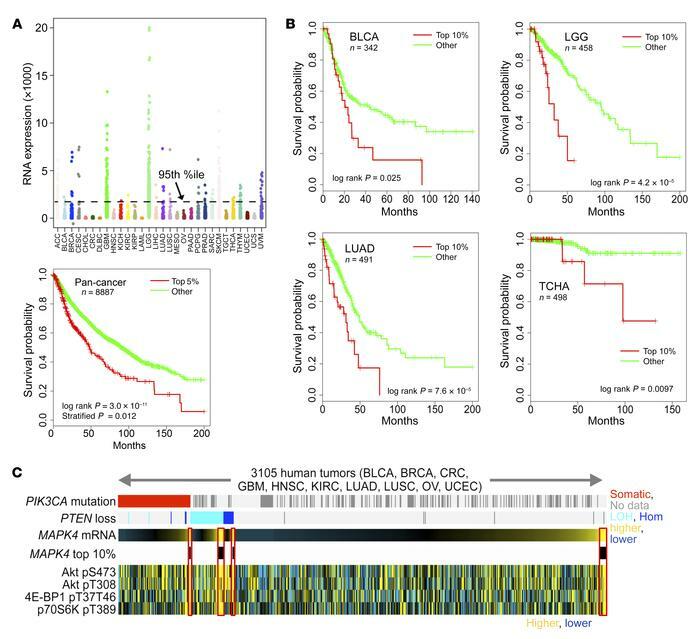 Lower panel, Kaplan-Meier plot of overall survival in patients across all TCGA data sets, as stratified by high MAPK4 expression. P values by log-rank test and by stratified log-rank test (correcting for tumor type), as indicated. (B) Kaplan-Meier plot of overall survival in patients within specific cancer types, as stratified by high MAPK4 expression. BLCA, bladder cancer; LGG, low-grade glioma; LUAD, lung adenocarcinoma; THCA, thyroid carcinoma. P values by log-rank test. (C) Heatmaps showing the correlation of MAPK4 expression with expression of specific proteins profiled in TCGA pan-cancer datasets by Pearson’s coefficient. Significance of correlation: P < 1 × 10–17 for each protein feature.